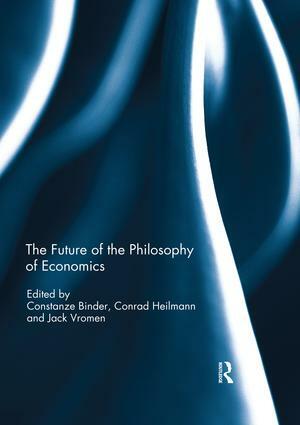 Originating from the International Network for Economic Method conference, hosted by the Erasmus Institute for Economics and Philosophy (EIPE) at the Erasmus University Rotterdam in 2013, this book chooses key themes that reflect on fascinating new developments in the philosophy of economics. Contributions discuss new avenues and debates in important and upcoming areas, such as the philosophy of economic policy making, decision theory, ethics, and new questions in economic methodology. The book offers an excellent insight into cutting edge research in these fields that are about to shape the future of the philosophy of economics. This book was originally published as a special issue of The Journal of Economic Methodology. Constanze Binder is Assistant Professor of Philosophy and Co-Director of the Erasmus Institute for Philosophy and Economics at Erasmus University Rotterdam, The Netherlands. Her research focuses on the area where political philosophy and economics meet, in particular on social-choice approaches to justice, moral limitations of markets, the analysis of freedom, and the application of the capability approach to (economic) policy evaluation. Conrad Heilmann is Assistant Professor of Philosophy of Economics, a Co-Director of the Erasmus Institute for Philosophy and Economics, and Coordinator of the Research Master in Philosophy and Economics, at Erasmus University Rotterdam, The Netherlands. His research focuses on different topics in philosophy of economics, such as the foundations of decision and game theory, intertemporal decision-making, and measurement. Jack Vromen is Professor of Philosophy, Academic Director of the Erasmus Institute for Philosophy and Economics, and Dean of the Faculty of Philosophy, at Erasmus University Rotterdam, The Netherlands. His research concentrates on philosophy of economics, and more particularly on areas where economics and theories of evolution overlap, such as evolutionary economics, the evolution of social preferences, and neuroeconomics.